My husband and I joined hundreds at the summit of Grandfather Mountain yesterday evening to watch our eldest daughter and 800 others complete the 13th annual running of The Bear. 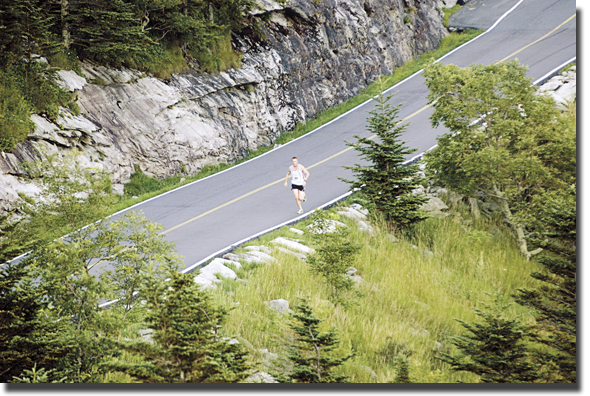 For those unfamiliar with the race, it is a 5 mile uphill battle to the top of the mountain. The official numbers aren't in yet, but they will be posted here when ready. Aaron Saft of Fletcher won the race with a time of 32:33. And yes, I'd buy shoes from him because The Bear isn't the first race he's ever won. so he ought to know a thing or two about running shoes. Aaron is in the top photo. 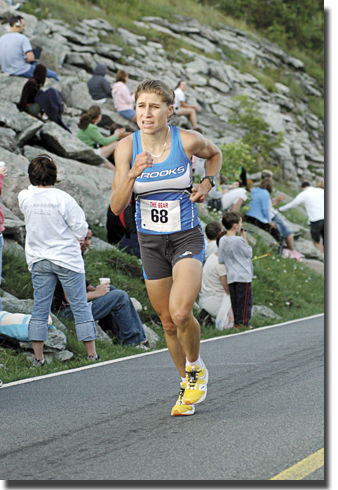 The second is Alison Bryant, the top female finisher, who came in at the 37:24 mark. There is a detailed story about Alison and her newlywed husband/running partner Jason in today's Winston-Salem Journal. The couple take running seriously. In fact, they worked their honeymoon around The Mount Washington Roadrace where Alison took 3rd place in the women's and Jason placed 9th. Now that's love.